The Coaches vs Cancer 3-Point Challenge helps the American Cancer Society save more lives. The 3-Point Challenge is a nationwide program that unites college and high school basketball teams and their fans for a common cause – ending cancer. Fans donate for every three-point shot their team makes or join their team as a Fundraiser to benefit the American Cancer Society’s live-saving mission. High School basketball teams are raising money with games played in January 2019 and college basketball teams are raising money with games played in February 2019. All proceeds from the 3-Point Challenge support the American Cancer Society’s goal of a world without cancer. Find your team, make a pledge and help beat cancer on the court! I had the wonderful experience of having won more than 700 games. I’d trade every one of those wins if we could finish this fight against cancer. Norm Stewart, former head coach of the University of Missouri’s men’s basketball program, cancer survivor, and member of the National Association of Basketball Coaches (NABC), provided the vision and inspiration for the Coaches vs. Cancer concept. He challenged fans to pledge a dollar amount for every three-point shot made by his team during the season. The concept evolved, and soon Coaches vs. Cancer became a nationwide collaboration between the American Cancer Society and the NABC. Today, thousands of coaches participate in Coaches vs. Cancer initiatives each season. Coach Stewart’s initial concept returned nationwide in 2017 and is now called the Coaches vs. Cancer 3-Point Challenge. Fans are invited be part of the excitement by donating for every three-point shot made by their favorite team. Teams compete on the court and raise funds off the court to defeat cancer! The American Cancer Society helps patients like Eileen Fautex. Eileen, a top student and athlete, was diagnosed with Ewing sarcoma while in her third year at Virginia Tech. Eileen and her mother stayed at the American Cancer Society Hope Lodge® – Baltimore community during Eileen’s six weeks of radiation. The facility provided a home away from home for Eileen and her mother, while saving them money and stress. I’d much rather prevent a cancer, than have to diagnose and treat and cure it, because then we save the patient all of the problems of treatment. 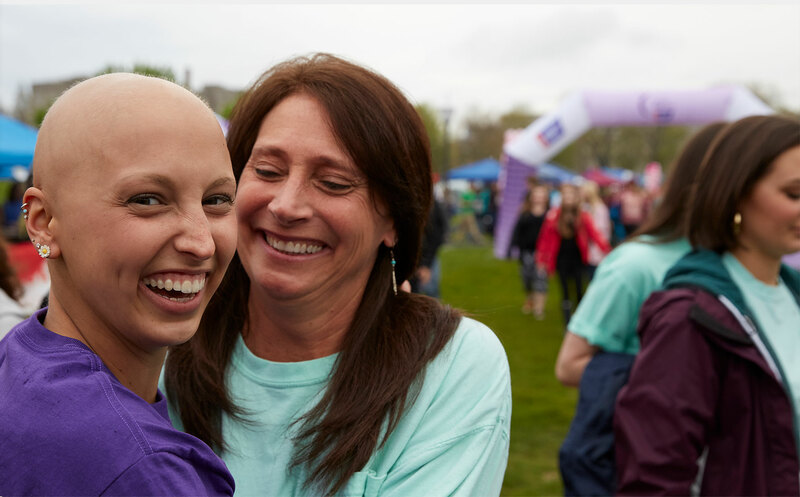 want to learn more about getting involved with coaches vs. cancer? PLEDGE IT is the leading performance-based fundraising website. We believe support for a cause is earned, not given. Our community of athletes are inspired to earn the change they want to see in the world! Join the movement at pledgeit.org. © 2019 American Cancer Society, Inc. All rights reserved.The American Cancer Society is a qualified 501(c)3 tax-exempt organization.